West Bromwich Albion made pre-tax losses of £7.5m last season as they were relegated from the Premier League. The figures are from the Baggies' 2017-18 financial statement to 30 June 2018. The club had made a profit of £39.7m the previous year. 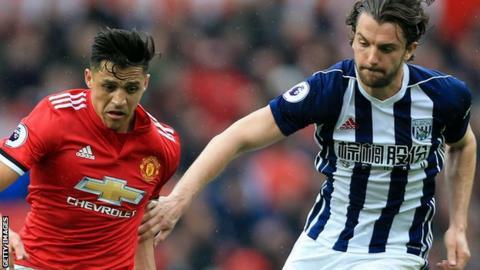 The pre-tax loss would have been worse but it also takes into account the £3.5m they received from Leicester for central defender Jonny Evans, a deal that was completed at the beginning of June. Jenkins - who was chief executive from 2010 to 2016 and returned to the club in February 2018 - said 12 months ago he was shocked by the state of the club's finances and warned there was no more money for wages. The chief executive said the latest accounts underlined those comments, adding: "But I also wish to make it clear that, regardless of our fate this season, the club remains on a solid financial footing and can look forward to the future with confidence. "Clearly, there are extreme differences between competing in the Premier League or the Championship but we are equipped to tackle those challenges from a sound position." West Brom are fourth in the Championship and look likely to be in the play-offs; they are six points from an automatic promotion spot and 12 clear of seventh place. They have won three successive games under caretaker boss Jimmy Shan after the sacking of club legend Darren Moore on 9 March. The club say they retained the majority of their Premier League squad in a bid to regain its top-flight status "at the earliest opportunity". It is understood Albion felt they would not have been not certain to make the play-offs had Moore remained in charge. Within the statement, West Brom say they have spent a further £11.8m on new players, including goalkeeper Sam Johnstone and defender Kyle Bartley, and brought in £16.4m from sales. The club's turnover for 2017-18 was down just over 10% to £124.76m. Total wages were £92m (74% of income).